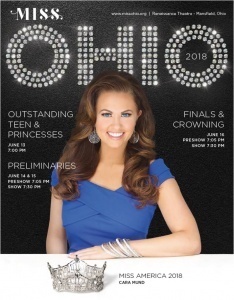 The Hathaway Group was approached by The Miss Ohio Scholarship Program to develop their program booklet for the first time in 2015. The Program Executive Director was looking for someone who could offer professional design on a budget. The Hathaway Group was pleased to help this incredible organization as it’s primary mission, to empower young women, was very close to our hearts! Small portions of the book were offered to us from the National Scholarship Association and by the program participants including the cover and the ads. All other items in this program were laid out by The Hathaway Group’s Graphic Design Team. Pagination of the document proved especially challenging as items were received over a period of time and in no particular order. Finding information layout that would lead to a good user experience was important to us and integral to the project’s success. Coordination with volunteer staff, program directors, and several other entities created both a better final product and a more comprehensive program for participants and their families, as well as attendees to purchase as a souvenir of the event. Click here to see excerpts from the program booklet. National pages and several of the ads (items not created by The Hathaway Group) have been redacted to offer a view of final product which shows our capabilities in layout and graphic design.